**WAITING LIST** We are pleased to offer members the chance to tour Withers’ new London office, shortlisted in the regional BCO Awards 2019 in the category of ‘Fit Out of Workplace’. Join the NextGen North committee for a tour of the recently completed tombola house in Sunderland, which is a new high spec headquarters for Europe’s biggest online gaming company. SOLD OUT - Following last year’s sell-out lunch we very much look forward to celebrating London’s leading projects and the talented professional teams that make them happen. We are pleased to offer members the chance to tour Bidwells’ newly refurbished office in Trumpington, Cambridge, shortlisted in the regional BCO Awards 2019 in the category of Refurbished Workplace. Following the successful tour of Aurora during its last stages of construction, BCO and BCO NextGen are excited to provide a follow up tour given by some of the occupiers and fit-out contractors. Join the BCO Midlands & East Anglia Committee for the launch of the latest BCO Research paper on The Future of Business Parks. We are pleased to offer members the chance to tour One Heddon Street, designed by Barr Gazetas for The Crown Estate, and shortlisted in the regional BCO Awards 2019 in the category of ‘Fit Out of Workplace’. Join BCO NextGen London for an exclusive tour of One Fen Court. Another chance to see the newly opened building, for those who missed out last time. The Civil Service is responding to the rapidly changing nature of work and leading the way by providing modern, flexible working environments. Widely regarded as one of the best property networking events, the BCO Scottish Awards Lunch is a great opportunity to stimulate new thinking on the design, development and occupation of offices and celebrate the achievements of the talented professional teams in our industry. Join BCO NextGen Scotland for an exciting opportunity to find out about the refurbishment of KPMG's Edinburgh office. The BCO Northern Awards dinner is a great opportunity to stimulate new thinking on the design, development and occupation of offices and celebrate the achievements of our talented professional teams. BCO NextGen invites members to attend a variety of office tours in Manchester before the Regional BCO Awards evening at The Principal Hotel in Manchester. The disruptive forces reshaping the way we work call for an equally disruptive response in the way we serve customers in the office industry. There is a wide and increasing skills gap in both the quality and quantity of talent able to deliver the customer experience expected by today’s corporate occupiers. Business parks were a highly favoured investment sector in the 1980s and 1990s. However, in recent years they have fallen out of favour with investors and to some degree with occupiers too. This has been fuelled to some extent by a movement back to central city locations by both occupiers and residents as Britain’s city centres have experienced considerable regeneration and have become much more attractive places to live and work. Consequently, the future of business parks is looking more challenged, with many starting to suffer from obsolescence. 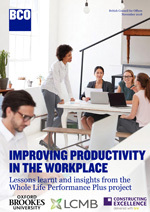 Improving Productivity in the Workplace: Lessons learnt and insights from the whole life performance plus project. Become a member of the British Council for Offices (BCO) & join a powerful community of industry professionals, all with one aim - improving office space.